This book took me about two weeks to read, filling every day with another society that collapsed. This books presents you with a variety of societies in different locations and conditions and ages of the world that for some reason failed after a shorter or longer time of sustainability. The writing and the low of the book are excellent. It’s kind of an eye-opener, as much as the other book by Jared Diamond that I read last year – “The Rise and Fall of the Third Chimpanzee“. You can read about the history of some of the cultures, the likely reasons for their downfall and how those same precursors for collapse are still in the game in the world today. Although it seems to have been categorized as history, which it certainly is, it is also about the environment. It has a really strong message, which seems to suddenly creep up to the reader by the end of the book. A part of it is that although in historical times societies fell in relative isolation without much impact on other parts of the world, then at the present time the globalized world could and should be viewed as one intertwined society, that is influenced by the activities of all the world’s population and politicians, miners, fishers etc. Having just finished reading the book about an hour ago I’ve got a feeling that I’ll be still thinking about it a week from now. 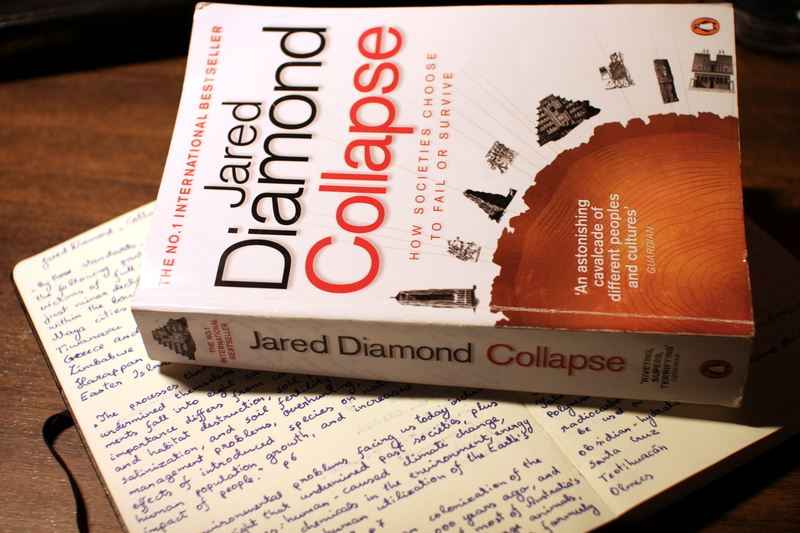 This entry was posted in Non-fiction and tagged Collapse, Jared Diamond, science, society. Bookmark the permalink.